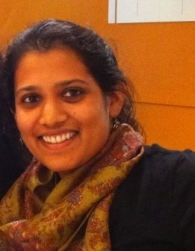 Former CDAC Intern Maneeshika Madduri of Stanford University has been awarded a Fulbright U.S. Student Program scholarship to Nepal in Energy. Manchali was a high school summer intern at Carnegie from 2007 to 2009 and for a full year during her senior year as a part of Thomas Jefferson High School's school researcher program. She was semifinalists in the Siemens Competition for Math, Science, and Technology in 2008 and a semifinalist in the Intel Science Talent Search competition in 2009. At Stanford, Maneeshika majored in Electrical Engineering but took courses on Technology and National Security, and Nuclear Weapons, Energy, Proliferation and Terrorism through the Center for International Security and Cooperation. These courses were taught by former LANL director Sig Hecker and CDAC Partner Rod Ewing. She was one of the few engineering students to participate. The Fulbright Program is the flagship international educational exchange program sponsored by the U.S. government and is designed to increase mutual understanding between the people of the United States and the people of other countries. The primary source of funding for the Fulbright Program is an annual appropriation made by the U.S. Congress to the U.S. Department of State, Bureau of Educational and Cultural Affairs. Participating governments and host institutions, corporations and foundations in foreign countries and in the United States also provide direct and indirect support. The Program operates in over 155 countries worldwide. Her brother Achintya Madduri, was also an Intel Finalist and Carnegie intern. He is currently studying electrical engineering at University of California, Berkeley.